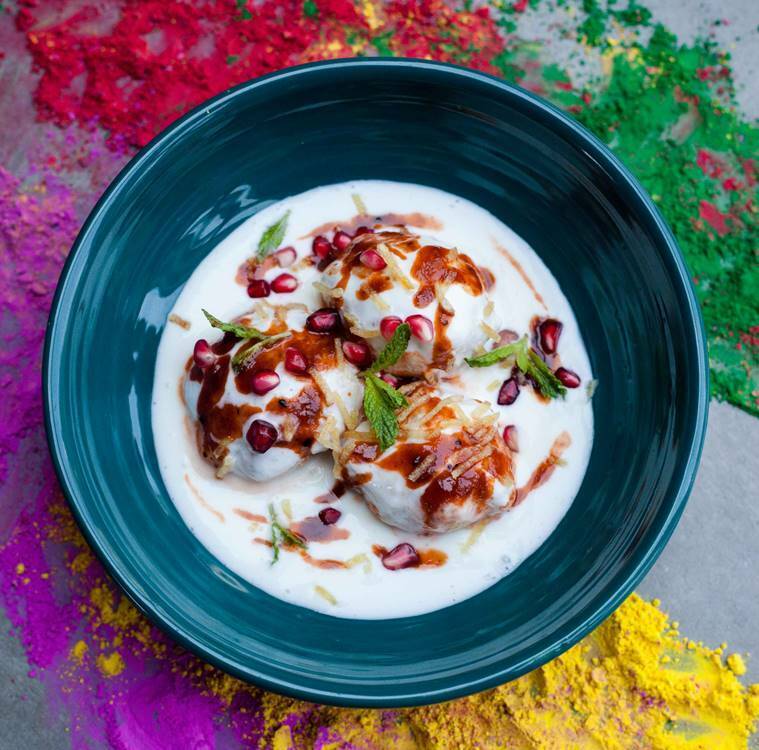 Holi 2018: Something spicy, something salty and something sweet! 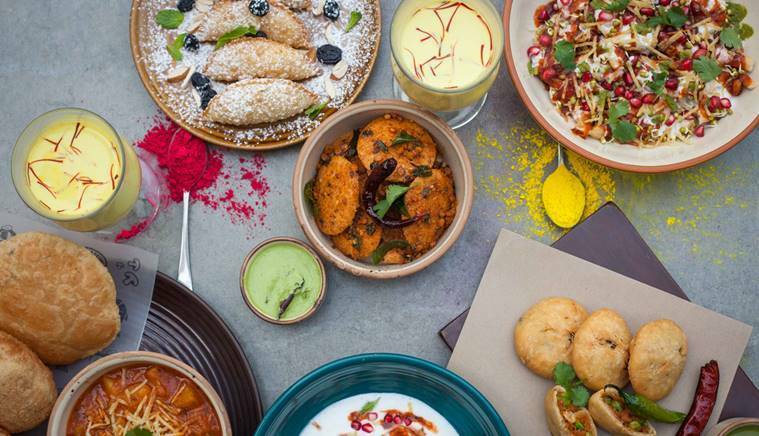 Impress your guests with these unsual Holi dishes. As India is all set to celebrate one of the biggest festivals of the year, Holi, on March 2; and just playing with colours is not enough. Of course, the splash of colour is integral part of the high-spirited festival, but what fun is any event without good food, some well-meaning pranks, and catching up with friends and family? And any adda session and festivity is incomplete without tasty snacks and drinks. Especially when it comes to Holi, when there’s no missing out on yummy gujiyas and refreshing thandais! So, while you plan to enjoy the festival of colours with full fervour, thinking about how to make your Holi party fun and happening, we’re here t help you so that you need not worry about the food. Here are some Holi special recipes with some interesting twist to make your long weekend even more exciting. And if you are one who likes to even spike it up with some hemp (bhaang), into this year’s festivities, then we have got that covered too. Give your traditional Dahi Vada an Italian twist this Holi! * Wash and soak the urad dal in water for 30-40 minutes. * Drain out the water and then grind the dal in a mixer to make a smooth batter adding the measured quantity of water slowly to form a uniform mix. 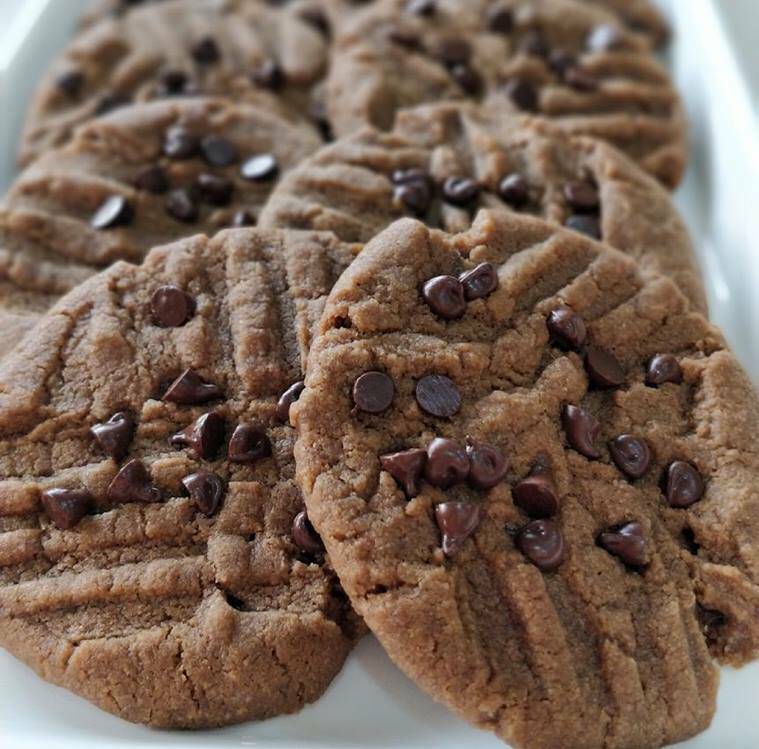 * Transfer the batter into a large bowl and beat the batter in a circular direction with your hand for 5 minutes to incorporate air into the batter making it fluffy. * Now add salt to taste, and mix lightly. Do not rest long after adding salt, as it leaves water and makes batter watery. * Now dip your hand in water, and start make small sized vadas. Make a small pocket and add stuffing of ricotta and walnut mixture. * Heat the oil and fry the vadas keeping the flame on medium heat and stir the vadas occasionally. Fry the vadas till they turn golden brown. * To remove the excess oil off put the vadas on a kitchen towel. * Immediately after, put the vadas into a bowl of lukewarm salted water and allow the vadas to be immersed completely. * Allow them to absorb the water for 5-10 minutes and let them swell. * Now take the vadas out of bowl the and squeeze out the extra water by squeezing it between your palms. * Place three or four vadas on the serving plate, put three to four tablespoons of thick whisked curd over the vadas. * Add some some green chutney and tamarind-date chutney over the curd. * Garnish with few coriander leaves, pomegranate seeds and potato salli and serve. Tired of regular aloo and papri chaat? This Holi try some spinach one. * First to make palak pakoras, take spinach leaves, remove the hard stalks, and rinse them well carefully. Pat it dry with the help of a kitchen towel or paper napkin and leave aside. * For the batter, take besan (gram flour), rice flour, semolina, salt, red chilli, turmeric, sweet soda, carom seeds and salt. * Add some water and make a smooth medium-thick batter and let it rest for 10 mins. * Now take a pan for deep frying on medium heat. Once the oil gets hot, take one leaf and dip into the batter, remember that the leaf should be coated properly from all sides. * Fry the coated leaves until it changes the colour and become crispy. Keep it on a paper towel to remove excess oil. 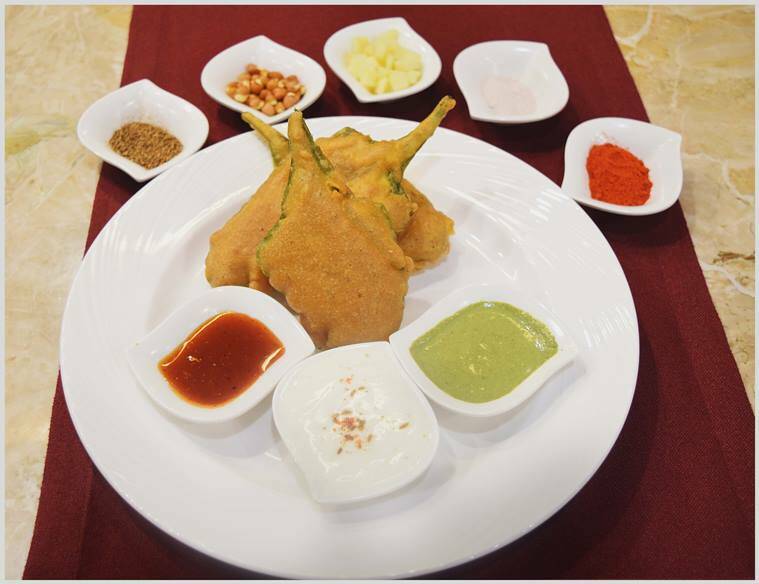 * Now to make the chaat, arrange the palak pakora on the plate and drizzle some green mint chutney on top. * Add the whisked yogurt, saunth chutney and chickpeas. * Sprinkle some chaat masala on top and serve hot before the palak pakoras get soggy. 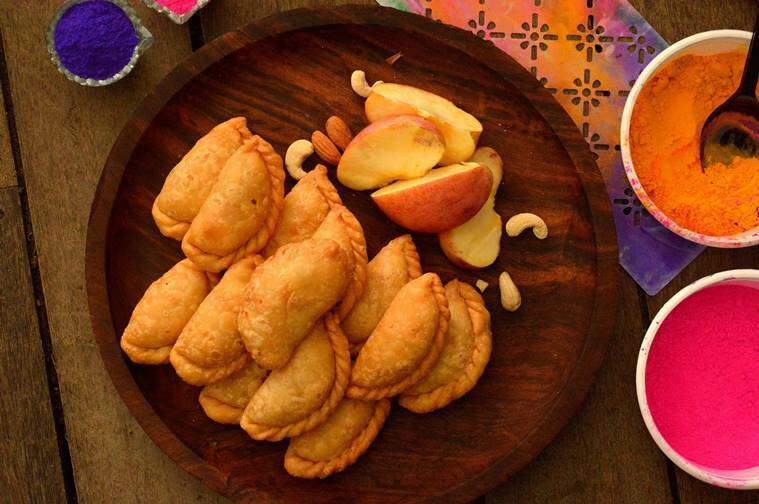 Because no Holi celebration is compelete without some gujiya! * Combine the all-purpose flour, salt and ghee in a bowl and mix well with your hands. * Now add enough cold water to knead it into a soft dough. Rest the dough for half an hour. * For the stuffing, heat a pan and add grated mava to it. Stir it continuously without burning. Cook till it turns golden brown. Switch off the flame. Let it cool and set again. * Add kopra, powdered sugar, dry fruits, grated apple, cardamom powder and cinnamon powder to mava and mix well. * Now make small balls out of dough and roll into small poories (round shape). * Place the stuffing on one half of the rolled dough. Stick the sides and make a half moon by sticking the edges. * Make all gujiyas and fry them in hot oil at medium low heat till golden in colour. * Remove onto an absorbent paper and let them cool. 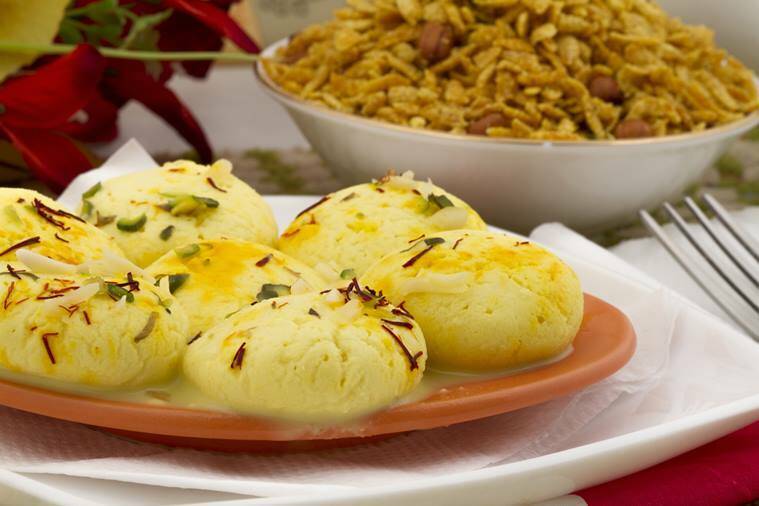 This Holi try is mouthwatering combination of Thandai and Rashmalai! * Begin the process my making rasgullas. Bring the milk to boil in a large vessel and boil for 4-5 mins. * Dilute the vinegar with 2-3 cups of water and slowly add to the simmering milk. Add more water-vinegar mix to the milk if required to curdle completely. Once the entire milk solid (Chenna) is separated from the light yellowish green water, add a few ice cubes and 2-3 cup water to prevent the chenna from cooking further. * Strain all the chenna and wash it under running water to remove traces of vinegar. Gather it in a piece of cheesecloth and hang for 2-3 hours to remove excess water. * Transfer it to a flat container and knead with soft hand for 10 minutes to get a uniform mixture. Add the refined flour and knead for another 5-6 minutes to get smooth and soft dough. * Add the 2 cups sugar along with 5 cups water and bring to boil. Boil for 5 mins before adding the chenna balls. Boil and cook till the balls are half immersed in the syrup. Once the rasgullas are cooked, they will submerge in the sugar syrup. * To make the thandai, boil the milk in medium low flame and then add saffron. Stir occasionally and let it release the colour. Allow the milk to cool down. * Now in a mixer ground all the dry fruits, poppy seeds, peppercorns, fennel seeds. Ground the spices separately and keep it. * Now mix the dry fruit paste and into the cooled milk and mix thoroughly. Add sugar and mix again so that no lump is formed. * Add the rose water into the shake and keep it in the fridge to chill. * To assemble, gently squeeze the rasgullas to remove excess sugar water. Then drop them into the chilled Thandai milk base. Refrigerate and serve chilled, garnished with almond and pistachio. 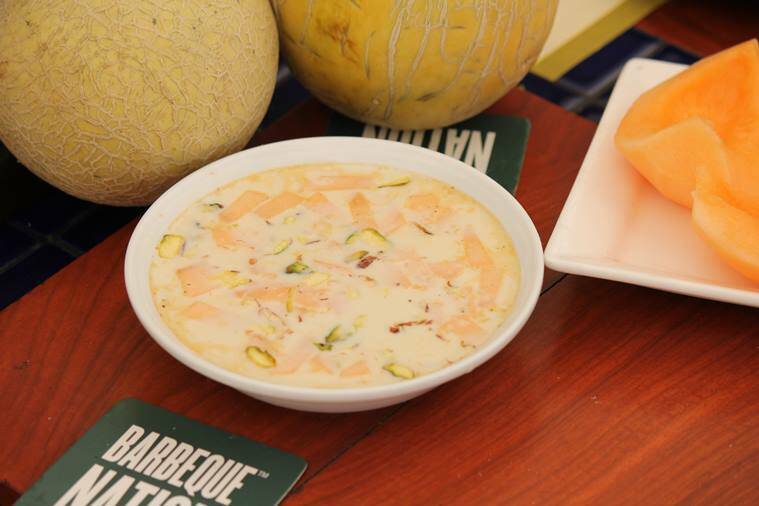 This fruity phirnee is perfect after a hectic Holi celebration. * In a large mixing bowl pour the coconut milk and add the jiggery. Mix well and allow the jiggery to melt. * Add cardamom powder, muskmelon, rice flakes and saffron to this milk. * Mix well and refrigerate for 2 hours and serve chilled. Holi without Thandai is hard to imagine. * Boil the milk in a bowl and soak saffron strands in it. 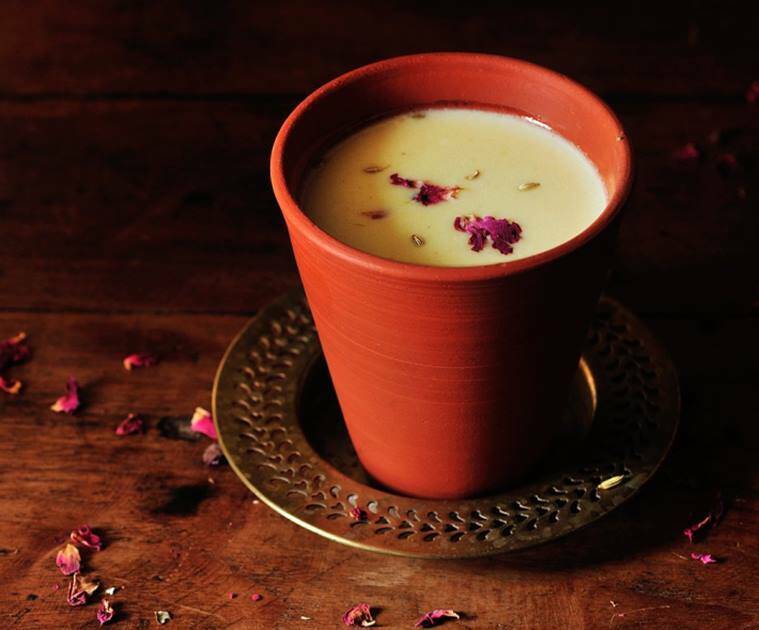 * Allow it to rest for 15-20 minutes as the saffron in hot milk release its colour and flavour. * Stir in with ladle and keep it aside for cooling and divide it into two containers. * Now, take all the dry fruits and grind it in a grinder. Add them gradually to one part of the divided milk. * Take all the spices and one by one add them to the milk. * Gradually add sugar and stir it along with gulkand. * Add rose water to the other part of the milk along with water and mix it with the above milk with ingredients in it. * Keep the mixture in the refrigerator for a while and serve chilled. Garnish it with some chopped pistachios and rose petals. And to add some more fun and laughter, here’s some bhaang! * Mix the flour, baking soda and Bhaang and keep aside. * In another bowl, melt the butter and the brown sugar to it. * Fold Nutella and the flour mixture together. * Add the milk and make it into a dough. * Place the cookies on the Silicon Pad and sprinkle chocolate chips on top. * Bake at 170 degrees Celsius for 12 minutes. Next Next post: 3 Nutrient Dense Smoothies Recipes!